22 watts with 6V6s and 5Y3GT. (1) 5AR4, (2) 6L6s and (5) 12AX7s (or 5Y3GT with 2 6V6s). Bass, Treble and Midrange controls, BRIGHT switch and RAW control. 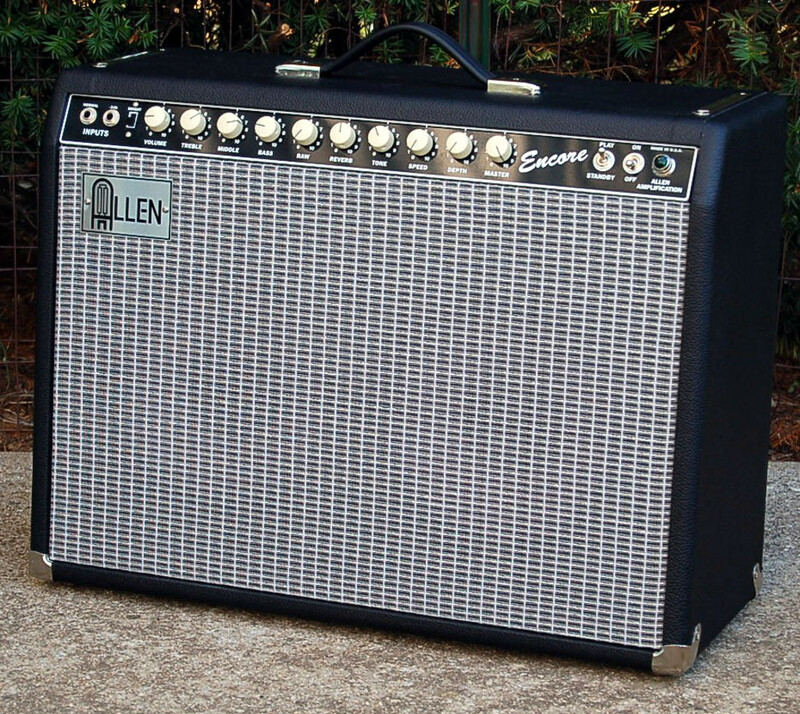 All-tube, long 3-spring medium-delay tank in a heavy vinyl reverb bag with MIX and TONE controls, shielded cables. Stainless-steel angled-front chassis with welded corners. Cool and quiet running Allen TP40 200ma power transformer, TO35MT paper bobbin interleaved winding output transformer, TR reverb transformer and TRCH choke are all U.S. made. Optional TO40MT upgrade output transformer for more clean bottom end performance. See TRANSFORMERS Page for details. 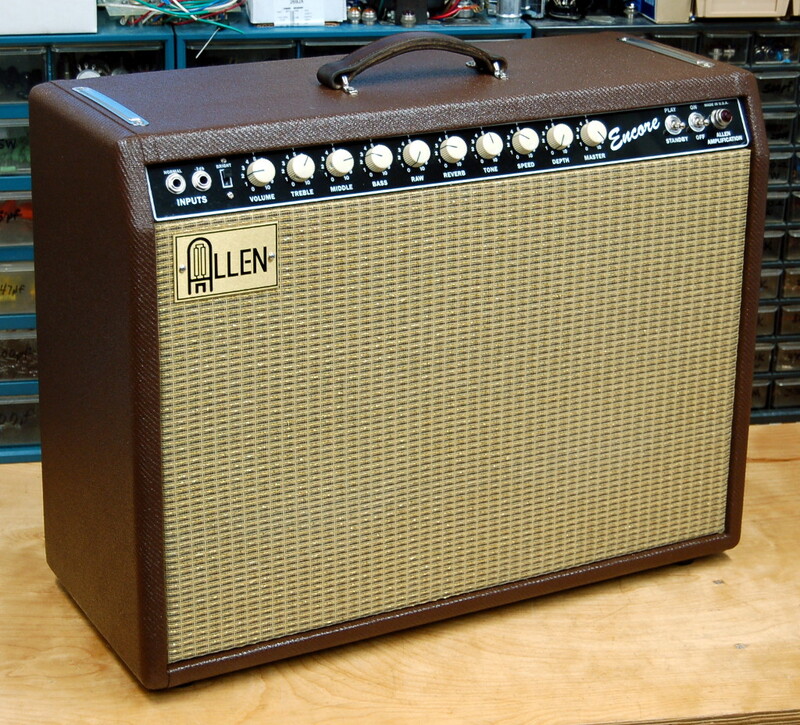 Design is loosely based on the mid 60s Fender Vibrolux Reverb but without a normal channel. 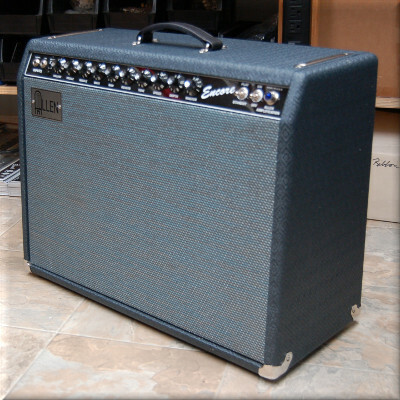 Design is enhanced with 2-knob reverb, non-opticoupler tube tremolo, master volume control, middle control, RAW control, rear-panel bias measurment jacks, impedance switch, and front-panel power switches. Finger-jointed pine cabinet with black Tolex covering and Black/White/Silver sparkle or black grill cloth. Optional Blond/Wheat, Blond/Oxblood, Brown/Wheat and Tweed/Oxblood coverings available. 1/2" birch plywood floating-type baffleboard and (2) screw-on rear panels. Chrome bottom corners, rubber feet, chrome chassis straps, black-rubber steel-reinforced carrying handle with chrome caps/screws. Leather handle also available. 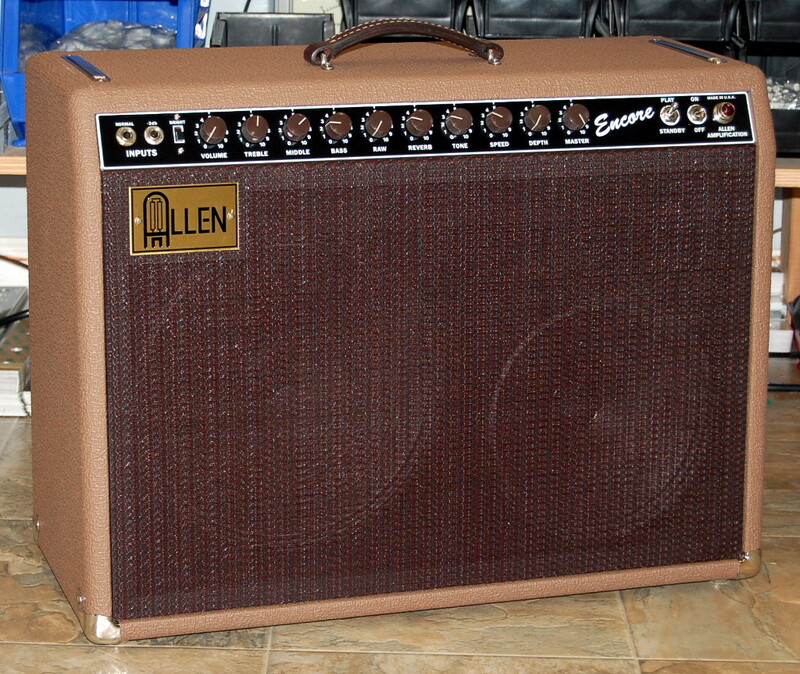 (1) 12" Red, White and Blues, (2) 10" Copperheads or (1) 15" Legend 151 standard. Brown Vibrolux tremolo, impedance switch, unique RAW mid/gain boost control, front-panel power switches, master volume, and convenient rear-panel bias measurment jacks. Front-panel mounted POWER and STANDBY toggle switches for easy access. 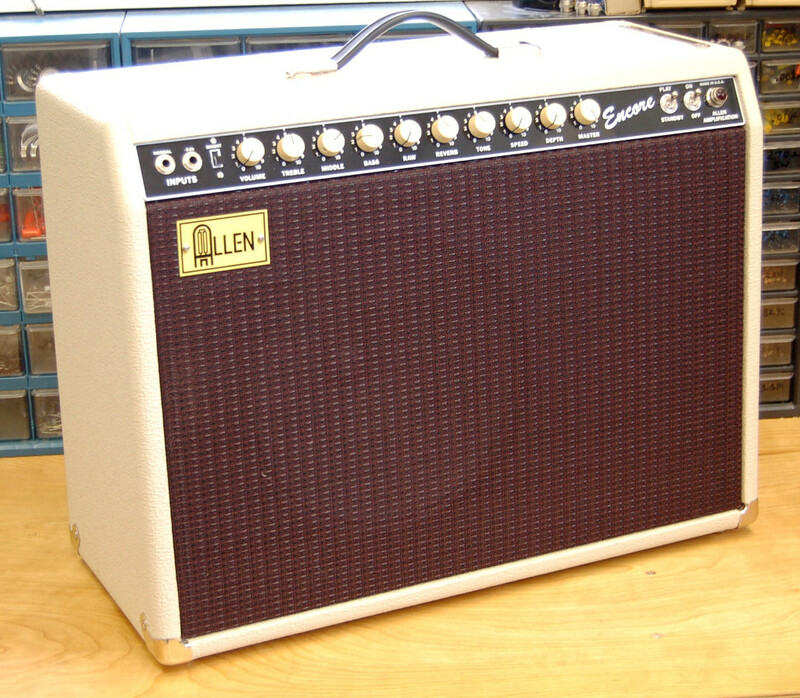 1x12 Combo - 24"W x 18"H x 10"D, 46 lbs. 2x10 Combo - 24"W x 18"H x 10"D, 50 lbs. 1x15 Combo - 24"W x 20"H x 10"D, 58 lbs. 4x10 Combo - 24"W x 25"H x 10"D, 55 lbs. Head - 24"W x 10"H x 10"D, 30 lbs. Encore clips below provided by The Sound LLC in Charlottesville, VA. Clips played by Ian Lawler on a PRS, Jason Butler on a 50's reissue Tele, or K.W. Miller on a 50's reissue Tele. Encore clip on YouTube used to demo a MXR Custom Badass Modified Overdrive pedal. Thanks to Bob Schell at brookwoodleather.com.